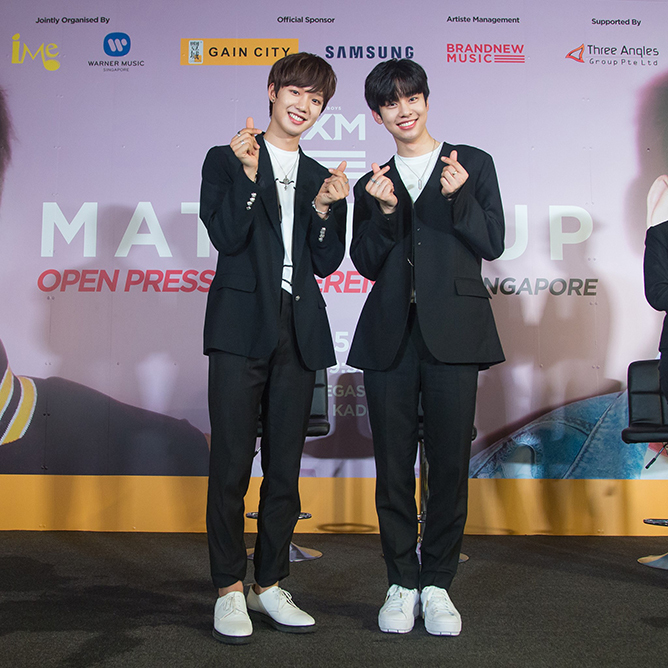 95% – was what MXM rated their chemistry with each other at the open press conference for their [MATCH UP] Fanmeeting in Singapore. We’ve always known that Youngmin and Donghyun are inseparable since their Produce 101 days, so it comes as no surprise these two would make an unbeatable pairing as MXM. And fans are more than convinced that their impeccable teamwork isn’t just for show when they were in town last week, all sunny smiles and bubbling with infectious energy as they bounced around the stage. Can’t get enough of them? Here’s a collection of moments that proved they’re the perfect duo. #1 They have the same variety sense. When asked what kind of variety shows would they want to appear on during the press conference, MXM spared no hesitation in answering Running Man as they’re both very active. “We’d love to take part in a programme that throws us in the wild and allows us to pick up survival skills and do everything from scratch,” Youngmin shared, which immediately brings to mind Law of the Jungle. Donghyun added, “We enjoy cooking and travelling as well, so Three Meals A Day or a travel show would be fantastic.” Hey fellow producers, how does a love call to Rhymer sound? #2 And they love teasing us. One of the most adorable moments during the fanmeeting was when they were asked what fans could expect from the show, to which the crowd playfully called out for the boys to show off their six-packs. “Not today, maybe next time!” quipped an amused Youngmin, while Donghyun cheekily patted his tummy and looked around for his non-existent abs. Check out their hilarious reactions below! #3 They’re same same, but different. To further prove their strong bond with each other, MXM played a quick game where they attempted to match up their answers to a series of ‘This or That’ questions. Although they had differing opinions on a couple of questions – Youngmin prefers summer while Donghyun prefers winter; Youngmin likes coffee while Donghyun likes tea – they still have plenty in common with one another. For instance, both of them chose the colour black over white. Not to mention they have the cutest bro-handshake ever. Friendship goals! I was really impressed with the boys because THE SANG LIVE. 💓 And YOUNGDONG is the sweetest friendship ever, just look at this handshake. #4 Their fan service game is A+. When it comes to dishing out fan service, MXM never disappoints. Besides blessing us with top-notch live performances, the two-hour set was peppered with mini game segments where fans could get upclose and personal with the lads. Some lucky fans were even able to walk away with a selfie polaroid with the boys, much to the envy of everyone else in the audience. However, the rest of us had our fair share of perks too as we were treated to a mandatory high-touch session and a group photo opportunity after the show – no one was left out. Both of them were clearly worn out towards the end, but they showed no signs of exhaustion and entertained fans throughout it all. With this alone, we have no doubts that MXM will certainly go far in their music career. #5 They are humble at heart. 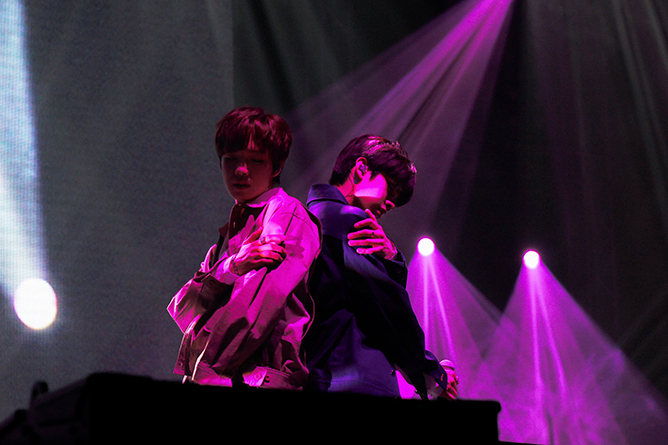 As this was their first time performing in Singapore, fans put in extra effort to make it an unforgettable experience for MXM. Not only did they specially prepare banners that read “Let’s be together forever”, they also made a video montage and brought out a diamond-shaped cake as a surprise for the boys – which was a huge success. “We feel like we’ve received a lot more than what we gave you today. We are so grateful for your love and support,” Donghyun enthused, overwhelmed with gratitude as both of them bid farewell to their adoring fans. Three hours later, we left the venue with heads swimming and hearts oh so full. It’s that time of the year again for “fashion’s biggest night out”, where Hollywood’s brightest stars deck themselves in the most head-turning of outfit choices. Against the backdrop of outlandish imagery inspired by the theme of Heavenly Bodies: Fashion & The Catholic Imagination, this year’s Met Gala saw plenty of iconic pairings gracing the red carpet. From Shawn Mendes and Hailey Baldwin’s swoon-worthy couple debut to 2 Chainz’ extra AF proposal to his longtime girlfriend, the annual fashion extravaganza is shaping up to be the most show-stopping one yet. While we were aware that Shawn Mendes has been cosying up to Hailey Baldwin recently, the exact nature of their relationship was never confirmed. That is, until the rumoured lovebirds showed up with their arms comfortably wrapped around each other at the New York Metropolitan Art Museum, making their relationship red carpet official. The Canadian crooner looked dashing in his sleek maroon suit as he walked down the red carpet hand-in-hand with the model, sporting a gorgeous dusty rose ‘do adorned with white flowers. While this may be somewhat sad news to Shawn diehards, do not despair – we sense an album full of love songs coming up! 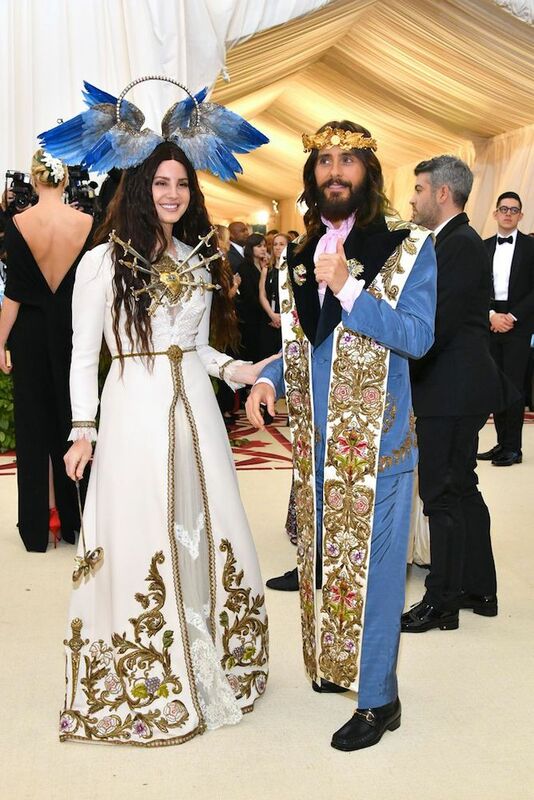 Everybody looked heavenly, but what really caused our jaws to drop was Lana Del Rey and Jared Leto’s godly ensembles. Lana ditched her gypsy witch vibes for a beautiful ivory dress, while Jared looked the complete opposite of his demented Joker persona. Our personal favourites: Lana’s sword-skewered gold heart and deep blue winged headdress (a nod to the virgin Mary?) along with Jared’s matching golden wreath that put all the flower crowns to shame. We know celebrities love being in the centre of attention, but 2 Chainz took the cake. The American rapper took a brave step in his relationship with his longtime girlfriend Kesha Ward – by proposing on the Met Gala red carpet in the most glamourous way yet. Although they’ve been engaged since the 2013 BET Awards and have had three children together, they’ve never made it official. 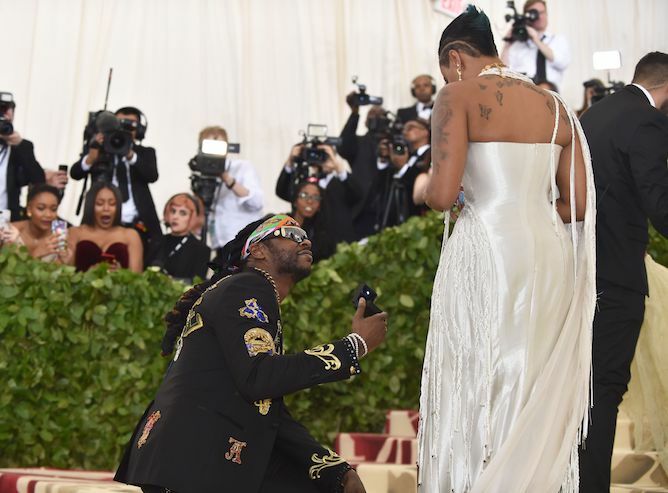 Whipping out the black ring box in the midst of climbing the stairs, 2 Chainz got down on one knee and pulled a Donald Trump… of course, she said yes. Sound the wedding bells! With their unrivalled sisterly bond and fashion-forward styles, Mary-Kate and Ashley Olsen have long been hailed as untouchable icons. 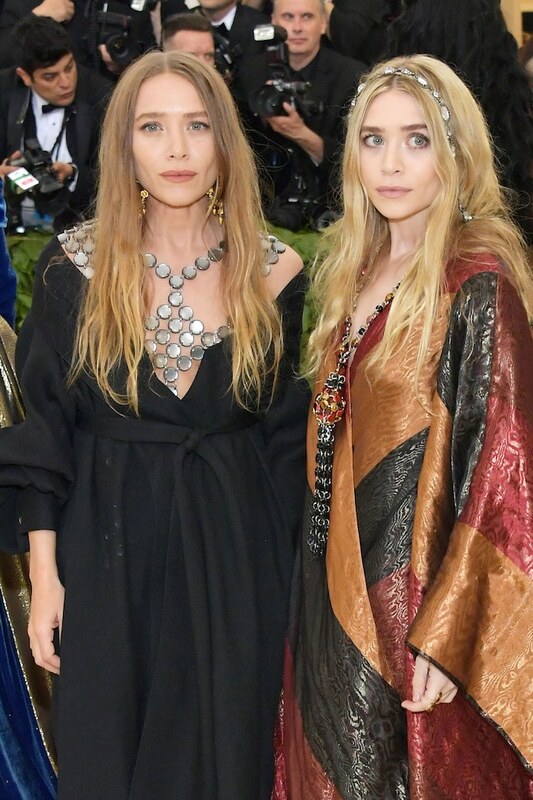 This year, the twin beauties outdid themselves with their Game of Thrones-esque ensembles. Looking like a pair of bohemian princesses, their flowing robe-like gowns was nothing short of breathtaking as they expertly posed with stoic model expressions. We can’t wait to see what these goddesses come up with next year! The two Riverdale stars strutted down the red carpet in complementary outfits – Lili Reinhart in a shimmering silver gown and Cole Sprouse in a classic suit, and the cameras just couldn’t get enough of them. Despite striving to maintain a lowkey attitude towards their dating rumours, the pair has been spotted together countless times and even took a quick getaway to Hawaii recently. Showing up at the Met Gala pretty much confirmed their relationship status, but whatever it may be, our hearts will never stop shipping Bughead! George and Amal Clooney’s relationship is one of the few Hollywood romances that has withstood the test of time. We’re still recovering from the split of star couples like Chris Pratt and Anna Faris, Channing Tatum and Jenna Dewan, and the iconic Brangelina – but safe to say, the Clooneys are proof that true love still exists. At the Met Ball, the stunning husband and wife duo graced the cameras with candid poses of them smiling at each other in adoration – talk about couple goals! Not surprisingly, Kylie and Travis caused quite a stir with their fashion choices. Turning up in simple, pitch-black ensembles amidst the flood of intricate ivory and pastel shades at the Met Gala was a bold move, and we wouldn’t have expected anything less from the reality star diva and her beau. Say what you want about Stormi’s parents, but one thing’s for sure – this duo knows how to make an impression. Which is your favourite #MetGala moment in the list? Tell us in the comments below! Fall Out Boy Wants To Collaborate With Justin Bieber? 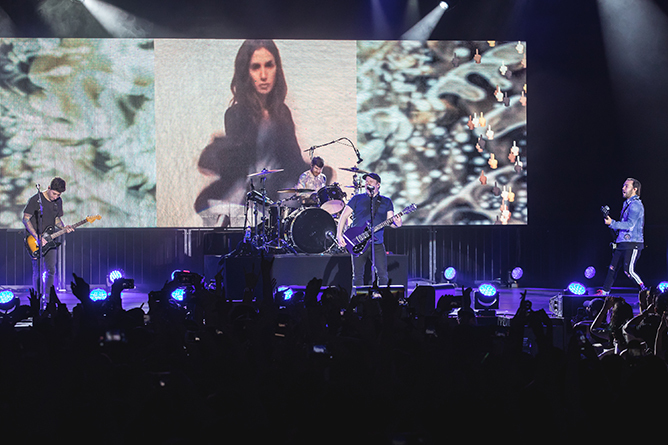 Consider us blessed that Singapore was the only Southeast Asian stop for Fall Out Boy’s ongoing MANIA Tour. 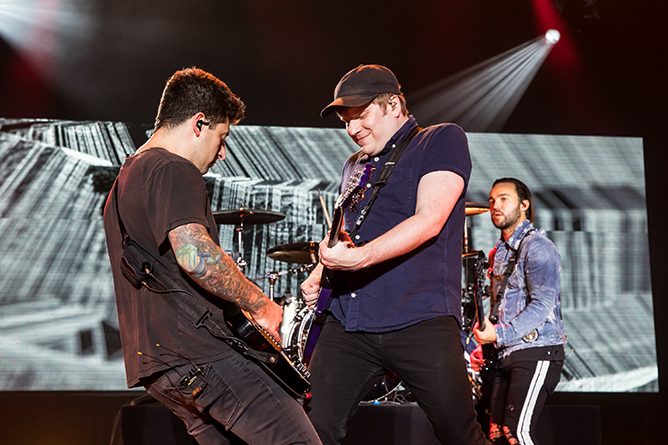 True to its name, it was exactly what FOB brought to the venue of [email protected], which was packed with both older devotees reminiscing their emo yesteryears, as well as fresh-faced younger fans who obviously caught on to the FOB fever, complete with purple-dyed hair and skinny jeans. Their return might have been overdue – the pop punk quartet last played in Singapore in 2013 – but there was nothing tardy about their rock party. Prior to their show, we caught up with Pete and Andy for a quick chat where they talked about their MANIA album, working together with RM of BTS, and the possibility of creating music with Justin Bieber. Well, they might be kidding about the last point. But then again, are they really? Read on. Teenage: Let’s talk about your new album MANIA. Following the success of American Beauty/American Psycho, what was the musical direction you wanted to bring MANIA in? Pete: We wanted to do something completely different. American Beauty/American Psycho felt like an extension of Save Rock and Roll as they were made so close together. MANIA was like taking a left turn. Teenage: You’ve decided to scrape and rewrite MANIA, pushing back the release by four months – which doesn’t feel like a whole lot of time to redo the entire album. Could you walk us through how that was like? Pete: Records used to take a long time to make, but you’re able to do so much on just your laptop now so four months is more than enough time. I mean, we really did throw away a large portion of the album; there’s little bits of pieces here and there but it didn’t feel inspired enough. For us, I think it’s better not to make a record than to make one that feels uninspired. Teenage: Having been in the music industry for a long time, how much do you think the industry has changed since you first started? Pete: I think it has changed so much, mostly in the way that people are able to listen to music in different ways now, you know? And they can curate their own playlists so it’s really interesting to see how genres have lesser meaning than it seems like. Andy: Like [what Pete] said, you’re divorced from genres so you just like things and you’re not picking them out of a specific box just because they’re this or that. That’s really cool. Teenage: How do you strike a balance between staying relevant in the music industry and staying true to your sound? Pete: Now that we’re 15 years into the band, I think it’s important to make music for ourselves. We don’t want to be like a Burger King where we make whatever you want for your order, but at the same time we’re not ever trying to purposefully alienate people. Music is meant to be inspiring, we’re always going to think about our fans and perform around the world for them. Sometimes you nail it and they’re like “Oh my God, this makes so much sense” and other times you push too far or not far enough and they’re like “this isn’t great”. But you can’t just let that dominate; you just have to make the art you want to make and hopefully people will respond to it. Teenage: What’s the most maniac moment you’ve ever experienced throughout your career? Pete: When we went to places for the first time, like Moscow, and there were a ton of kids at the airport. It was pretty insane. Andy: Yeah, I think airport moments and new places where we don’t frequent a lot. It does feel like it’s scariest, coolest and craziest thing all wrapped up in one. Teenage: So… tell us about the llamas on the MANIA album. Pete: Their names are Frosty and Royal Tea! They were in the music video for ‘Young and Menace’, which is supposed to depict what it’s like to live in a world of monsters and you don’t realise you are and you aren’t one. And they were just skateboarding with Post Malone and it just evolved into this thing that was never supposed to be. Teenage: Some people consider Panic! 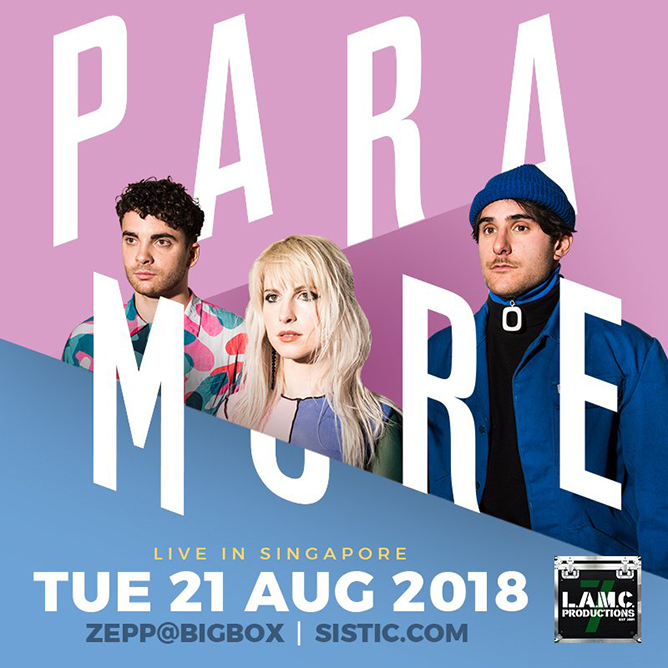 At The Disco, Paramore and Fall Out Boy as the holy trinity of emo pop punk – and all of you performed in Singapore before! Would we ever see a collaboration between you guys? Pete: (Laughs) We toured with Paramore once and with Panic! At The Disco countless of times. I don’t know, would it end the world if we all played together? We’ll never know. Did Justin Bieber say ‘Never Say Never’? Or we could just play with Justin! Andy: We could compete with Avengers: Infinity War for the biggest crossover yet. Teenage: Speaking of collaborations, your remix of ‘Champion’ with RM was a huge hit. Could we be expecting more team-ups with other K-pop bands in the future? Pete: Yeah, definitely! I think it just has to be organic. How we met and all was a long story – we sent the song, he liked it and the rest is history. This was one collaboration that happened organically, which makes it more authentic. If it happens again, it would be cool. Teenage: Lastly, what’s next for Fall Out Boy? Pete: No more albums! You heard it here first – no more albums, until we get this Bieber collaboration done (laughs). Well, our record contract is done so we can do anything. You know how you always feel the most inspired when you do something completely new? We don’t know what it is yet though, wait and see! Nostalgia, non-stop hits and plenty of ‘Dance, Dance’ were the order of a pre-Public Holiday night, as the foursome made their third stop on Singapore soil. With the crowd amped up to full excitement, there was nothing to stop the FOB boys from kicking it into higher gear, dishing out songs like ‘Irresistible’, ‘Immortals’ and fan favourite ‘Sugar, We’re Goin Down’ back-to-back. Ever the most forward of the band, bassist Pete Wentz delighted the crowd with his quick quips in-between songs, at times from an elevated stage in the middle of the crowd, dressed in a neon-yellow construction jacket which demanded attention from all corners of the room. Drummer Andy also had his moments to shine, thrilling audiences with a drum solo mashup that included heavier versions of Kendrick’s Lamar’s ‘Humble’ and Post Malone’s ‘Congratulations’, while Patrick Stump impressed throughout with his pitch-perfect vocals sounding nearly identical to the band’s records. While already individually talented in their own right, it’s truly captivating to see how all four members complemented each other during their songs, energy effortlessly bouncing off each other’s presence. 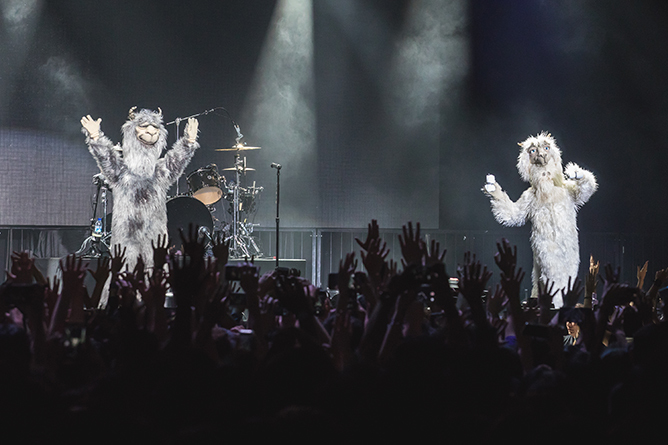 While the performances were top-calibre, assisted by visually arresting video backdrops and surprise cameos from their llama mascots, Frosty and Royal Tea, we did wish the band spent more time interacting with their ardent fans. But perhaps it’s due to their seasoned career for wanting to focus on the music instead, and who could blame them when most of the varied crowd were screaming back every line to their catalogue of songs? 15 years into their music career together, and Fall Out Boy proved that their solidarity and brotherhood together is still as strong as it was from their eyeliner-heavy days – and that’s why they’ll go down as one of the greatest bands not only of this decade… but for ‘Centuries’. It’s Dua Lipa and BLACKPINK in your area! After powering through a sold-out concert in Singapore last Friday, the ‘IDGAF’ pop diva flew straight to South Korea for the Seoul leg of her tour on 6 May – performing yet another solid show in front of a massive audience, which included a couple of famous faces such as BLACKPINK’s Jennie and Lisa! Fast forward to today, the BLACKPINK member is seen posing for a picture alongside her fellow bandmate, Lisa, with the queen of ‘New Rules’ herself – talk about a total “senpai noticed me” moment! The iconic photo is now Dua’s most-liked post on Instagram to date, with over 1 million hearts and counting. However, the BLACKPINK girls weren’t the only K-pop stars in attendance – JYP darlings Suzy and Somi were spotted as well. The former also uploaded a photo of the two together, along with her banner and autographed album. Dua even left a comment and followed the former Miss A member, making them mutuals on Instagram! Fangirl goals or what? In other news, BLACKPINK’s in the midst of preparing for a comeback on 22 June 2018. Hey papa YG, how does a Dua Lipa collaboration sound? Paramore Will Be Back To Rock Singapore This August! Our teenage-angst hearts are crying hard, but we’re dancing harder: Paramore is coming back to town! Seven years after their last show on our shores in 2011, the American rockstars are finally returning to Singapore to stage a full-fledged concert on 21 August at [email protected] Box. Even though they’ve been through several lineup changes and musical style shifts since we last saw them, we have no doubts that Hayley, Taylor and Zac will deliver an equally, if not more, explosive set as usual. Apart from their catalog of smash hits like ‘Still Into You’ and ‘Ain’t It Fun’, expect to jam out to recent bangers off their fifth studio effort After Laughter including ‘Hard Times’, ‘Fake Happy’ and ‘Rose-Colored Boy’. Early bird tickets will go on sale from 3 to 5 May at $158, while standard tickets will go on sale from 6 May at $168 via www.sistic.com.sg – get ready to snap it up!